I could write for about three days on what keratoconus is and how it affects people but in short, it is a condition which affects the cornea (the clear structure that lies over the pupil and iris). The cornea acts as the most powerful lens in the eye and consequently, the optical quality of this structure is crucial for good vision. It is helpful to point out that the normal cornea is utterly incredible to begin with. It is the only living structure in the entire human body that is completely optically clear, the only structure in the entire human body which breaths for itself (from the air around us), and is the most sensitive structure in the entire human body with over 11,000 nerve endings per square millimetre. I describe the cornea as being like steel reinforced concrete – it has a matrix gel (the concrete) and it has collagen fibres running through it (the steel reinforcement). It is the astounding regularity of the collagen fibres which gives the cornea its amazing optical clarity which is essential for visual function. Anything that causes these collagen fibres to become irregularly arranged causes the cornea to become cloudy. Just one example of this is the very clever pump which regulates the amount of water in the gel to maintain this regularity – to be honest, I find it incredible that it ever works to begin with! Keratoconus is a condition where the collagen doesn’t work properly and the shape of the cornea becomes irregular resulting in reduced vision. Well, as it turns out, that’s a very good question. 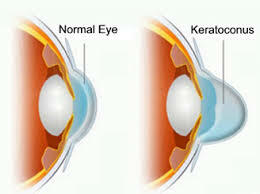 Keratoconus has a wide variety of different severities and presentations. There are a lot of people who are asymptomatic – they don’t have any problems at all and without specialist tests, neither they nor their optometrist would ever know. The first tell-tale sign is often that the irregularity causes a prescription for glasses which changes more rapidly than usual or in an unusual way. But prescriptions for glasses often do this so in itself this doesn’t tell us what we need to know. The diagnosis can really only be made with analysis of the curvatures and thickness of the cornea using a number of specialist instruments and even then, there will be certain incidences where we miss it. There is a not very straightforward family link with keratoconus so if a family member has it, it is worth investigating. Firstly it can be monitored – often it is not particularly progressive, so we do nothing more than watch it to see if it changes and talk to the patient about how they can manage symptoms and risk factors. Often the irregularity means that glasses do not give good vision and contact lenses are required. There is a standing joke that the contact lenses we work so hard to design and fit aren’t really doing the work – it’s the tear lens created behind the contact lens, filling in the irregularity in the front surface of the cornea that corrects people’s vision. Designing the back surface of the lens is pretty tricky though – the keratoconic eye is a very very complex shape and all of them are different. And if I get it wrong, it can cause permanent scarring. To give you an idea, the lens which looks like a little clear bit of plastic less than a centimetre across, the back surface is designed, using over twenty different parameters, each of them accurate to five hundredths of a millimetre. In order to get the very best performance possible, we use one of the widest ranges of contact lens manufacturers, types, materials and designs available anywhere in the UK – and there’s a reason for that. We have found the task isn’t easy and there is a lot to gain. Remember, many of our keratoconic patients can’t really see with glasses so contact lenses which give reliable crisp vision and all day comfort are very helpful. Thankfully, there are loads of really innovative products and techniques available – and we are always scouring the journals for more. We use standard and specialist RGPs, piggy back with a range of different soft lenses, specialist soft lenses, corneosclerals and sclerals – we find that this gives us the best chance of getting a really good result for you. More importantly, we stay hugely motivated to find the very best optical products for you. Regularly I find myself asking patients, “Yes, they are good, but are they good enough?” The question here is really whether the patient would like to put the time in to investigate other avenues. I joke that what we lack in skill, we make up for with pure tenacity! Finally, we put it together with an aftercare package which enables you to pay monthly for everything we do. The aftercare means you can be sure you are looking after your eyes properly and investing in good eye health. Occasionally, the cornea becomes so irregular and thin that the care of a specialist is helpful, so we try to keep really good links with the local specialists who are at the top of the game . If you would like to book a no-obligation appointment with us to discuss your keratoconus, give Ali or Emma a call on 02890 323 341 to book an appointment.